To make Baltimore Figure Skating Club an even greater place to skate. We are a volunteer organization, so we need members to help run the club. You could serve on the board of directors, run our test sessions and volunteer for Chesapeake Open. Contact Judy Carrig at carrigj@comcast.net and we'll make skating great! A big thank you to Sarah Withrow and her boyfriend, Matthew Cichy, and Doree Hudson (Mariana Hudson's mom) for running the Used Skate and Dress Sale on March 25. You were super helpful! Show your BFSC pride and support our club by competing at Chesapeake Open, June 21-24 at the Gardens Ice House in Laurel. Volunteers needed! Here is your chance to make the 2017 Chesapeake Open the best ever. Volunteer to be an ice monitor, give out awards, or help serve food. 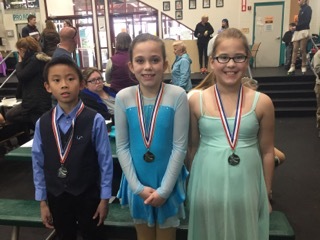 Congratulations to skaters who competed at Ice World in Basic Skills and Beyond on April 1: Jonathon Yin, 2nd No-Test; Ella Salvador, 1st Pre-Preliminary Test Track; Selena Staab, 2nd, Free Skate Introductory Beginner; Kayla Camarao, 2nd Basic Program, Basic 6; Mariana Hudson,1st, Free Skate 1; Maya Stengel, 3rd, Freeskate 2; LaToya Robinson, 2nd, Adult Pre-Bronze group B; Nikki Felts, 1st Adult Pre-Bronze group A. We can't give you one of the club's awards for skating accomplishments if we don't know what you've done this year. 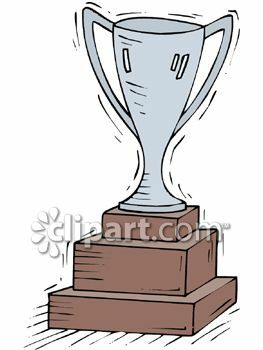 Send a list of your accomplishments -- competitions and placement, tests passed -- from May 1, 2016 to April 30, 2017 to Debbie Shapiro so that you can be considered for club awards. Email to Well93@aol.com. 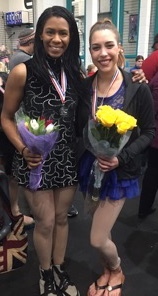 Join us for a sendoff to Adult Nationals for BFSC members Marty Romanik, Dennis Glorioso and Diana Cheng Sunday, April 9. Skaters will perform their programs at 2:30 p.m. Cake and beverages will be served. We will have regular Sunday sessions 12:30-1:20 p.m. and 1:35-2:25 p.m.
Skaters will perform, we'll give out club awards and we'll have a party. Sign up to perform in the Spring Exhibition. Annual Dues and membership forms are due in April. See Judy Carrig for details. 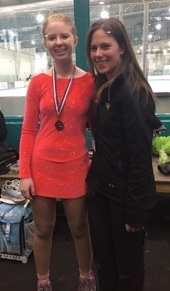 Mondays, 6:10 to 7 p.m. and 7:10 to 8 p.m.; Thursdays 5:10 to 6 p.m. (low level), 6:10 to 7 p.m. and 7:10 to 8 p.m.
Worthington Valley Figure Skating Club has Saturday morning ice at the Reisterstown rink (10:30-12:30) in May and June. BFSC members get club rates: ($12/hr. drop in or $10/hr. lock-in). 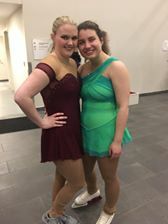 At Liberty University, March 4-5: for Towson U.: Lauren Carrig, 8th Gold Solo Dance; 4th International Solo Dance, 9th Intermediate Ladies FS Group A; Brooke Coyle, 12th Preliminary Group A Solo Dance, 4th in Pre-Preliminary FS Group A; Nikki DiMarino,10th Preliminary Group B Solo Dance, 9th Juvenile Solo Dance, 5th Pre-Juvenile Ladies FS Group A; Lindsey Armah, 12th Preliminary Group B Solo Dance, 6th Pre-Preliminary FS Group B; Anna Shchelokova, 7th Pre-Preliminary FS Group A; for University of Delaware, Chloe Roberts,1st Pre-Juvenile Ladies FS Group A; for New York University, Becky Blackstone, 6th Intermediate Ladies FS Group A. At University of Delaware, March 18-19; for Towson: Lauren Carrig, 5th Gold Solo Dance group B; 5th International Solo Dance, 3rd Intermediate Ladies FS Group B, 3rd Intermediate Ladies Short Group A; Brooke Coyle, 11th Preliminary Group A Solo Dance, 7th Pre-Preliminary FS Group A; Erin Campbell 7th Pre-Preliminary FS Group B; Nikki DiMarino, 8th Juvenile Solo Dance group A, 7th Pre-Juvenile Ladies FS Group A; Lindsey Armah, 11th Preliminary Group B Solo Dance, 6th Pre-Preliminary FS Group A; Dani Dermer, 5th Preliminary FS, 9th Preliminary Solo Dance Group B; for U. of Delaware, Chloe Roberts, 2nd, Pre-Juvenile Ladies FS Group A; for NYU, Becky Blackstone, 2nd, Intermediate Ladies FS Group A; for U. of Md., Wendy Shu, 6th, Preliminary FS; for Cornell, Margot Chirikjian, 4th, Juvenile FS Group B.